Come Relax in the Beautiful Vallecito Valley. 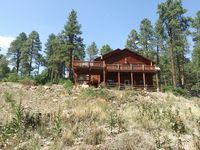 Property 11: Come Relax in the Beautiful Vallecito Valley. Property 14: Mountain Retreat! Vintage Creekside Cabin. Great Views And Close To The Lake. Property 25: Great Views And Close To The Lake. COME PLAY AT THE LAKE! ENJOY OUR COZY MOUNTAIN CABIN! Property 27: COME PLAY AT THE LAKE! ENJOY OUR COZY MOUNTAIN CABIN! Property 33: Secluded, rustic log house on three acres - dog-friendly & close to town! The house was beautiful with plenty of room for our family. We went to the ride the Polar Express for the first time and it was about a 30 minute drive from the house to town. The beds were comfortable and we enjoyed seeing the wildlife (mainly deer due to the time of year). The tub in the master sweet was perfect for a relaxing bath. We would definitely stay again.